The Khorramshahr is an Iranian liquid-fueled, medium-range ballistic missile. It is derived from the North Korean Musudan (BM-25) missile. 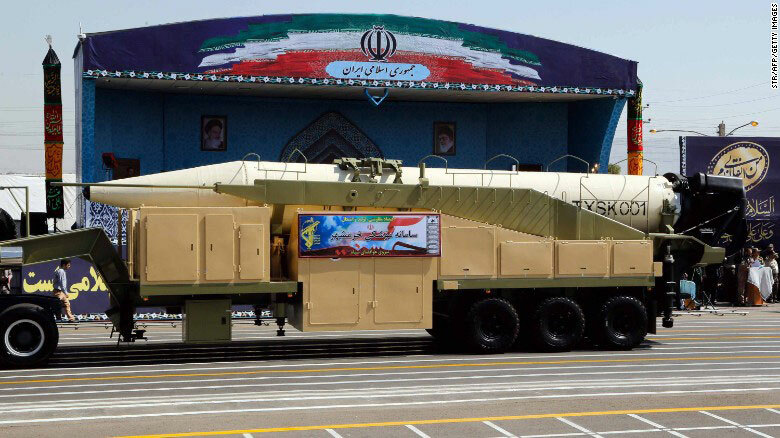 Iran first test fired the missile in January 2017, and first publicly displayed it at a September 2017 military parade in Tehran. It has a reported range of 2,000 km. Iran first displayed the Khorramshahr on September 22, 2017 during the country’s 37th anniversary of the Iran-Iraq War.4 The missile is named after the capital city of Khorramshahr County, Khuzestan Province, which Iraq had occupied between October 1980 and May 1982. Missile Defense Project, "Khorramshahr," Missile Threat, Center for Strategic and International Studies, September 29, 2017, last modified June 15, 2018, https://missilethreat.csis.org/missile/khorramshahr/. “Musudan (BM-25),”in IHS Jane’s Weapons: Strategic 2015-2016, ed. Jane’s C O’Halloran (United Kingdom: IHS, 2016), 43. CSIS Missile Defense Project, “Iranian Missile Launches: 1988-Present,” Missile Threat, August 17, 2017, https://missilethreat.csis.org/iranian-missile-launches-1988-present/. Joseph Trevithick, ”Iran’s New Ballistic Missile Looks a Lot Like a Modified North Korean One,” The Drive, September 23, 2017, http://www.thedrive.com/the-war-zone/14572/irans-new-ballistic-missile-looks-a-lot-like-a-modified-north-korean-one%20—%20on%20testing%209/23. Daniel Uria, “Iran conducts successful test of Khorramshahr ballistic missile,” UPI, September 23, 2017, https://www.upi.com/Top_News/World-News/2017/09/23/Iran-conducts-successful-test-of-Khorramshahr-ballistic-missile/6931506170457/. Lucas Tomlinson, “Iran’s supposed missile launch was fake, US officials say,” Fox News, September 26, 2017, http://www.foxnews.com/politics/2017/09/25/irans-supposed-missile-launch-was-fake-us-officials-say.html. Press TV, “Iran’s missile development multiplied after US threats: Commander,” September 25, 2017, http://www.presstv.ir/Detail/2017/09/25/536417/Iran-IRGC-Aerospace-Division-Hajizadeh-Khorramshahr. Idrees Ali, “Iran tested medium-range ballistic missile: U.S. official,” Reuters, January 30, 2017, http://www.reuters.com/article/us-usa-iran-missiles/iran-tested-medium-range-ballistic-missile-u-s-official-idUSKBN15E2EZ?feedType=RSS&feedName=worldNews&utm_source=Twitter&utm_medium=Social&utm_campaign=Feed%3A+Reuters%2FworldNews+%28Reuters+World+News%29; CSIS Missile Defense Project. Barbara Starr, “US sees ‘no indication’ Iran launched a ballistic missile, despite Trump tweet,” CNN, September 25, 2017, http://www.cnn.com/2017/09/25/politics/us-iranian-missile-launch-fake/index.html; Lucas Tomlinson, “Iran’s supposed missile launch was fake, US officials say,” Fox News, September 25, 2017, http://www.foxnews.com/politics/2017/09/25/irans-supposed-missile-launch-was-fake-us-officials-say.html. CSIS Missile Defense Project, “Musudan (BM-25),” Missile Threat, August 8, 2016, https://missilethreat.csis.org/missile/musudan/; Ibid. Ali Arouzi, “Iran Shows Off Khorramshahr Ballistic Missile After Trump Speech,” NBC, September 22, 2017, https://www.nbcnews.com/news/world/iran-shows-khorramshahr-ballistic-missile-after-trump-speech-n803701; Army Recognition, “Iran Test-fired of new Khorramshahr ballistic missile,” September 23, 2017, https://www.armyrecognition.com/september_2017_global_defense_security_news_industry/iran_test-fired_of_new_khorramshahr_ballistic_missile.html. The Iran Project, “Minister says Iran’s new ballistic missile ‘Strategic Weapon’,” September 23, 2017, http://theiranproject.com/blog/2017/09/23/minister-says-irans-new-ballistic-missile-strategic-weapon/. Press TV, “Iran successfully test-fires new ballistic missile: Video,” September 23, 2017, http://www.presstv.com/Detail/2017/09/23/536111/Iran-ballistic-missile-testfire.